Blogging inspiration is sometimes in short supply, especially when my health is at an all time low and all I want to do is blog about my health and how crappy I feel and trust me, no one wants to read about that! (I'll probably do a little post on soon though because it's bugging me out) But lately I have been trying to find some inspiration for blog posts when I'm down in the dumps so I go through things that make me happy etc... But it got me to thinking, I'm not the only one who goes through this right? So I thought what the hell, why not do a post on some blog ideas that can help some others out in finding inspiration. Throwback post. This could be to your teenage years, your child's first months etc..
Do you have any tattoos? show us. What book has had a big impact on you? I hope you enjoyed these blog post ideas and came away with something new that you can write about! If you try any of them out, Let me know, I'd love to read them! This is so helpful! I've had a bit of writers block recently but this has given me so many ideas! Great ideas . Added some of these ideas to a list for future posts . This is a great list! I'm definitely going to have to do some of these because it's so easy! (: Thanks for sharing. Oh wow so many brilliant post ideas!! Just been screen shotting them for when the ideas pool runs low! Also, I would love to read about your health and how your feeling, it makes posts so much more relatable in my mind. This is so helpful! I love wishlist and bucket list posts! Great ideas, I've been struggling to get back from my blogging slump so these will help! Really good post and I hope to use some of these. Very helpful to keep handy when you hit that "block". Very gracious of you to share! Thank you! I have been needing a bit of inspiration today and I've made note of a few of your ideas . Thank you for this great list it has helped me keep going. Such a great list! 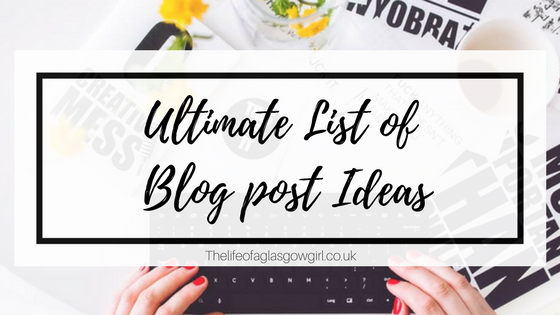 I will definitely be adding some of these ideas to my things to blog about list!